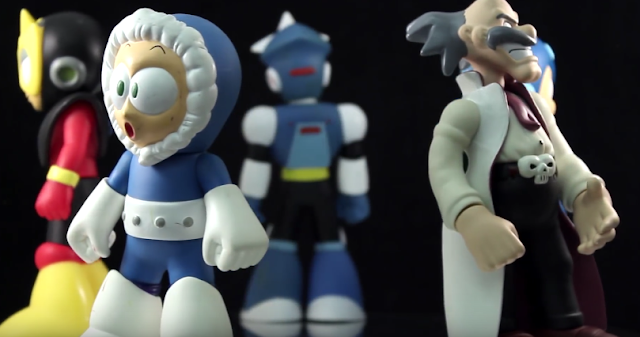 The first video kicks things off with cancelled Retro Roto figures: Dr. Wily, Ice Man, Snake Man, Heat Man and Wood Man. The prototypes start coming in at 5:30. Things get a little more interesting with the second video. A wealth of unproduced toys, samples and test shots are shown off from the get-go. You'll see different Mega Man color variations, Zero series Zero, and "Hot Topic Halloween Proto Man" (no joke). Jesse (the guy with the cool beard) promised a part 3 with even more cancelled Mega Man goodies. But that was in April. So the waiting game resumes! In the meantime you can see our previous cancelled Jazwares coverage here, here and here. I don't kniw Why the hell no one commented in this post. This is kinda cool. I wish we got More western made Mega Man figures. What ever happened to Jazwares? are they defunct or did they loose the Nega Man licence?